^ a b Connolly, John F. (October 2006). "Constellation Program Overview" (PDF). NASA Constellation Program Office. Retrieved 23 October 2014. ^ "Return to SSME – Ares V undergoes evaluation into potential switch". 26 December 2008. ^ William D Greene (4 June 2012). "J-2X Extra: What's in a Name?". NASA. ^ Augustine, Norman R.; et al. (October 2009). "Seeking a Human Spaceflight Program Worthy of a Great Nation" (PDF). 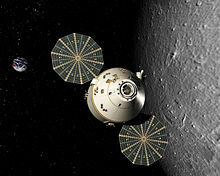 Review of U.S. Human Spaceflight Plans Committee. Retrieved 23 October 2014.